Congratulations! Your offer was accepted by the Seller. Now it’s time for opening Escrow, inspections, paperwork and planning “the move”! Your Closing day is set and only 30-45 days away. Although, this time will go by quickly, there is still so much to do and some things you should not do. 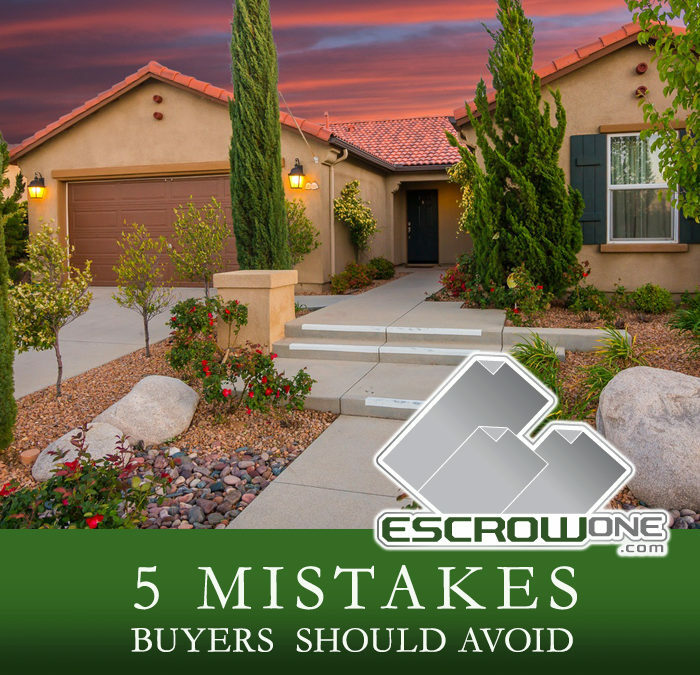 EscrowOne, Inc. would like to remind you to not make these 5 mistakes while in Escrow. This can avoid potential problems with your lender and keep your transaction moving forward within your set time frames. While you can breathe a little easier, remember, EscrowOne, Inc. is there to guide you making your experience as easy as possible so can be enjoying your new home before you know it. Here are the 5 mistakes to avoid while qualifying to buy a home or while in Escrow. A change in your employment during this process can enable you from receiving some types of loans. Employment stability is key! Most lenders prefer having a two-year job history in hand, so making a big career move could slow things down, or squash the deal entirely. A steady history of employment can offer you more loan options. Speak to the Lender of your choice if it is necessary to change your job and to hear what the best options are for you. One of the main factors the lender considers when qualifying you for your loan, is the ratio of your monthly income to your monthly debt. Your lender will check your financials several times before the closing of your loan and transaction. While it is tempting, don’t take out a big loan for improvements on the new place. Even more tempting, don’t buy a new boat or sign the lease on your new dream car that will look perfect in your new driveway. The bank will see this as new debt and will need to look at your financials again to see if you still qualify for your desired loan amount. In some situations, it may cause you to no longer qualify at all. This is the perfect furniture and appliances for my new home! We know, but don’t do it! Opening new credit accounts will again cause you financials and credit score to change and may trigger a new loan approval, jeopardizing your purchase. For now, just add those items to your shopping cart and push the button to purchase once your loan is closed. Always be sure to keep in touch with your lender and Escrow Officer. The Lender of your choice and EscrowOne will keep you informed of the time line so you can be readily available to immediately address any last-minute concerns and to execute documents as needed. Even though selling and buying at the same time can be chaotic, be sure to stay current with all bill payments. Late payments, too, can affect your credit score when financials are checked again just prior to closing the purchase of you new home. If you need more information on the Escrow process, of the purchase of a home, your favorite EscrowOne Escrow Officer would be happy to answer any of your questions. Find an experienced Escrow Officer below.